Habeeb H. Saleh, Ph.D., Richard Livingston, Ph.D. Concrete has been a critical material in the construction of all kinds of infrastructure facilities throughout the world. The durability of concrete is influenced by factors such as air void percentage, air void distribution, and cracking. This study describes an experimental method to quantify the internal air voids percent, air void distribution, cracks initiation and growth in concrete. Laboratory specimens of concrete were cast with variations in one of three possible variables of interest: air void target, potassium level or type of fine aggregate. Some of the specimens were stored in water for times of up to one year, during which they were periodically removed from the bath to be measured for expansion and also scanned by X-ray tomography. The X-ray computed tomography system consists of dual-focus 420-kV continuous x-ray sources and a digital detector. The detector consists of 512-channel linear array CdWO4 detector elements. The nominal spatial resolution of the image is 0.250 mm. Image processing and analysis software, ImagePro Plus, running on a windows 2000 Pro platform was used to process the CT images and to determine the void percentage, distribution and crack distribution. The processing steps included length scale calibration, thresholding, object recognition, and automated area calculation. The void percentage and distribution is proportional to the amount of entraining agents added to concrete mix. The distribution of cracks correlates with the amount of potassium present. Significant cracks were observed in specimens cast with silicate-type fine aggregates, but were not observed in specimens cast with carbonate-type fine aggregates. Furthermore, the crack areas increased with time for the concrete cylinders, but the crack growth did not show a simple correlation with expansion data. X-ray computed tomography (CT) offers a nondestructive technique for visualizing features in the interior of opaque solid objects to obtain digital information on their 3-D geometry and topology (1,2). In the simplest approach, directing planar X-rays that pass through the specimen along several sequences of paths, in several different directions, produces the set of CT images. The intensity of X-rays is measured before it enters the specimens and after it passes through the specimens. Scanning of a slice is complete after collecting the intensity measurements for a full rotation of the specimen. The specimen is then shifted vertically by a fixed amount and the entire procedure is repeated to generate additional slices. The minimum thickness of the slice, on the order of one millimeter, is set by X-ray tube and detector slit geometry. 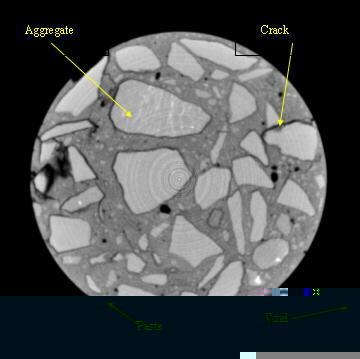 Images of the internal structure of concrete specimens were captured using the ACTIS X-ray CT system. The ACTIS system consists of a dual-focus 420 kV continuous X-ray source and 512-channel CdWO4 linear array detector (3). Horizontal slices of 1 mm were captured every 0.8 mm and were saved in TIF format. The captured image consists of 256 levels of gray intensity that correspond to different densities within the specimen. Air voids and cracks (low density) in Figure 1 are shown in black. Aggregate (high density) are shown in white. Voids in concrete are due to entrapped air and entrained air. Air is entrapped in the concrete during the mixing process of concrete, while entrained air is due to entraining agents, which are usually added to induce a homogenous distribution of voids in concrete to protect against freeze and thaw cycles. Two patches of concrete specimens were cast. The first patch was not air entrained, while the second batch were mixed with air entrainment target of 6.0%. 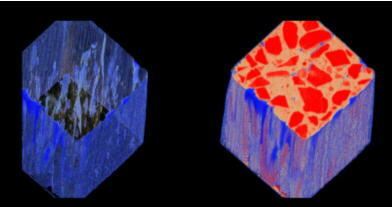 The two-dimensional images were processed and analyzed for void percentage and crack percentage and orientation. ImagePro Plus, running on a windows 2000 Pro platform was utilized to perform all image processing (4). The image processing task involved image calibration, thresholding, object recognition, and automated area calculation. Image calibration relates the physical dimensions of the object to the dimension of the image. Thresholding converts the 8-bit gray scale image into a binary image. Object recognition detects all voids and cracks and labels them. Finally, automated area calculation finds the number of pixels occupied by each objects. The air void percentage ranges between 2-8%. Figure 2 shows a three-dimensional mapping of voids in concrete. Cracks in concrete are normally generated due to mechanical and chemical effects. In this study, cracking is introduced by an accelerated test method which involves a series of physico-chemical processes that lead to deterioration of the material by expansion, cracking, and decomposition of the products of cement hydration. The concrete specimens were cast as part of an on-going research program to develop a method to measure damage associated with delayed ettringite formation. Specimens with different levels of potassium, 0.0, 0.7, 1.4, or 2.1 K2O by weight percent were cast . No cracks were found for specimens with 0.0%, 0.7, and 1.4% potassium level. Noticeable cracks were observed for specimens with 2.1% potassium level. Figure 2 is three-dimensional mapping of cracks in concrete. 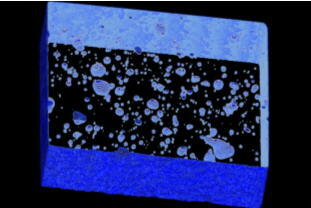 X-ray computed tomography imaging has a great potential for analyzing different phenomena, which influences the durability of concrete. Void percentage correlates with the amount of air entraining agents added to the mix. The estimated void percentage is lower than targeted due to limitations of CT system resolution. In order to measure void less than 50 µm in diameter, a micro focus tomography system should be utilized to scan a small specimen. The distribution of cracks correlates with the amount of potassium present. Significant cracks were observed in specimens cast with silicate-type fine aggregates, but were not observed in specimens cast with carbonate-type fine aggregates. Furthermore, the crack areas increased with time for the concrete cylinders, but the crack growth did not show a simple correlation with expansion data. ACTIS 600/420 Real-Time Radiography/Digital Radiography/Tomography, Report, Bio-Imaging Research, Inc. (BIR), Lincolnshire, IL, 1998. Image Pro Plus, Version 4.0. (1998). Media Cybernetics, L.P, Georgia, MD.